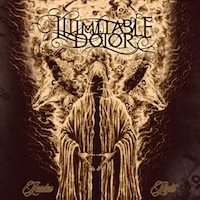 Today we go down under to the Australians of Illimitable Dolor and their second album Leaden Light, an album that looks pretty neat. Anyone who is collecting vinyl records should have a think about it. It is a five-track release that is supposed to be in the death/doom category and despite having only five tracks it plays for over fifty minutes, not really uncommon for the doomy genre. There are long songs, three of the five plays for over ten minutes and only one of them is of a more normal playing time. Death/doom metal is what it is, atmospheric doom, funeral doom is how some would describe it. Strong atmospheres, slow songs decent variation for an album that isn’t really varied, and I would say that it is fairly fresh even though it isn’t breaking much new ground in terms of the music it offers. So it will be familiar to those into this kind of music, the slow rasping vocals, slow songs, dark atmospheres, it is all there to be enjoyed for those who enjoys the doomier kind of music. I would claim that it is a strong production, and it is a good album. I like this album; it is a good one with good songs and strong atmospheres and depth but perhaps not an exceptional album in any regard. I might have been more positive if I had been a fan of the death/doom genre, which I am not but I still enjoy this one. It works especially well as background music for a dull day at work or a grey day in the autumn or winter, it sets up a good mood for such days and makes them better. I would think that it is a sure bet for those that enjoy the kind of music performed by these guys, well worth checking out. I think that if you like the doom or the more extreme metal in general you cannot really go wrong with this album and I would recommend that you have a look at it if you are that kind of music fan. As the atmospheres and melodies as well as the songs are so strong it might even work really well for a wider audience, it is an album that in the right circumstances can do really well thanks to its high quality and wide appeal. So if you are into the death and doom genre you should have a look at this album right now.